Want to ‘loosen up’ and feel more creatively free? I have been experimenting with colour for eons and have plenty to share on how to create delicious and complex looking backgrounds for your art escapades. This online art class teaches you how to create sumptuous, multilayered backgrounds for your mixed media artwork! Spray, paint, print, brush, roll, daub, dab and drip a rainbow of colour with me. It’s time to loosen up and let your style out! I love playing with colour! Don’t you just love the process of making art and layering colours and different art supplies? In and of itself, it’s an uplifting experience. The process and result is so yummy I think of it as a layer cake stacked with celebratory goodness! 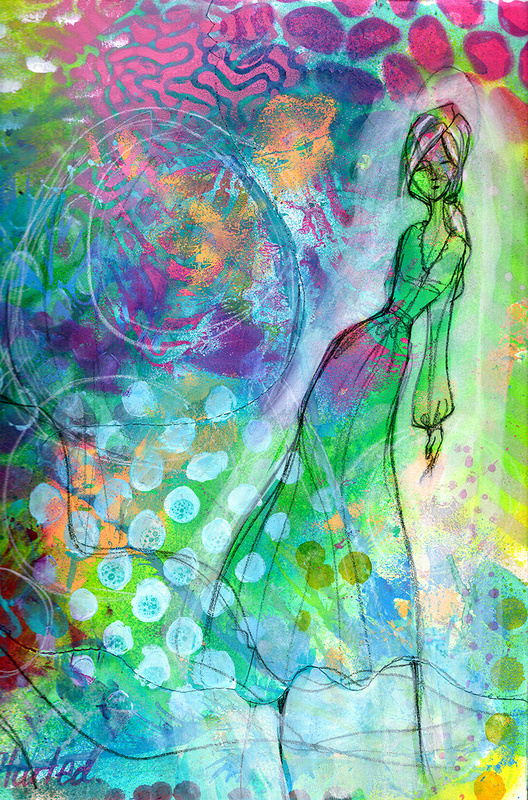 Sometimes I leave my color-full layer cake as is, but usually I use it as a background for more artwork. 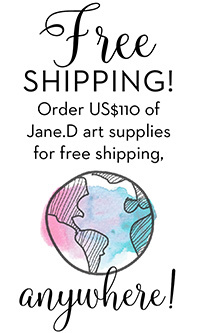 As an added bonus, if you love my art supplies from the Artomology, Making Faces and Jane Davenport Mixed Media collections, you will enjoy seeing them in action in lots of new ways! 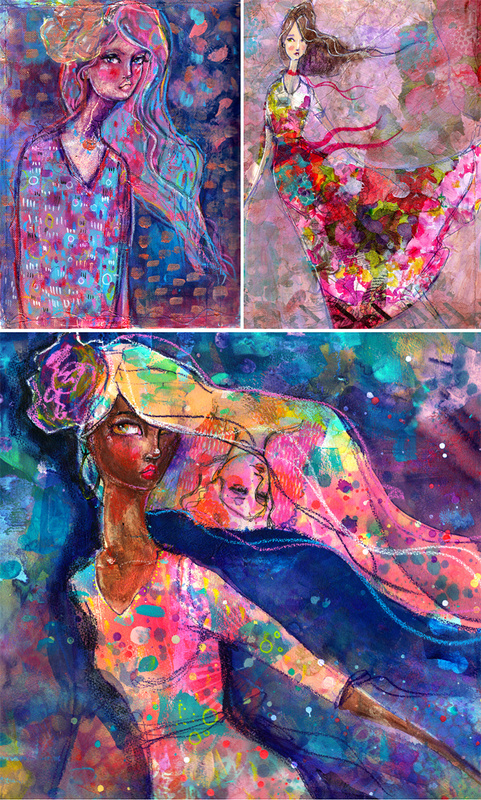 Mixed Media is all about layering! The workshop opens on April 15th. ‘LIVE’ session runs from April 15 to May 10. Lessons will be added throughout those dates. 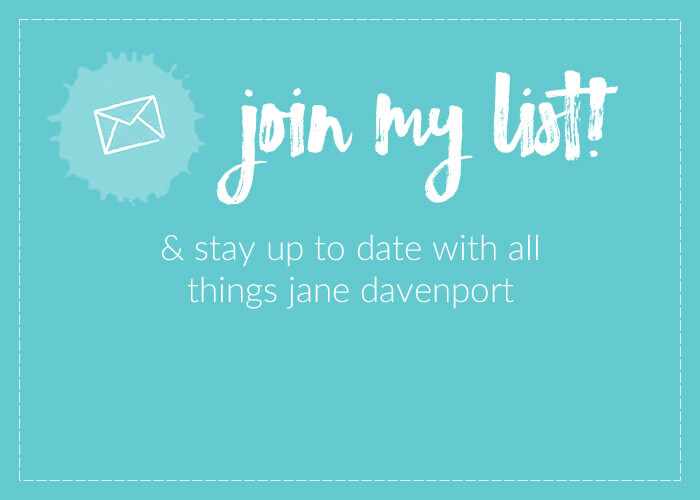 Jane will ‘Live Stream’ to the private Layer Cake Facebook Group to answer questions and connect with students during the LIVE session. At the conclusion of the LIVE session, the workshop is available to you on a self-guided basis. You have Lifetime access to the workshop and can access the content at your convenience! 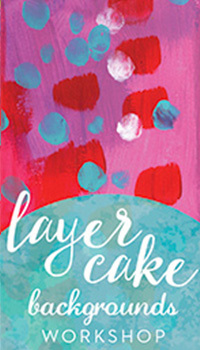 A little inspiration from Layer Cake lessons! I have some wonderful techniques that I personally use to get a page started that I will share with you in each lesson. From humble beginnings, we keep adding layers to build up a rich art concoction! You can then use these pieces as collage material, backgrounds or enjoy them as is. layered, beautiful juicy backgrounds throughout. Lesson 1 – Leftovers, Thrills and Spills! So many of my journal pages have began life as a little accident! 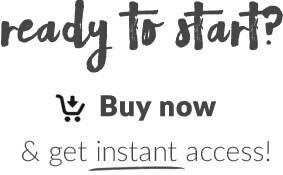 Let me show you how to help humble beginnings flourish into full artworks. Lesson 2 – Fill Your Plate! Gelli Arts made a wonderful tool that we can use for easy mono-printing. The results are magical! 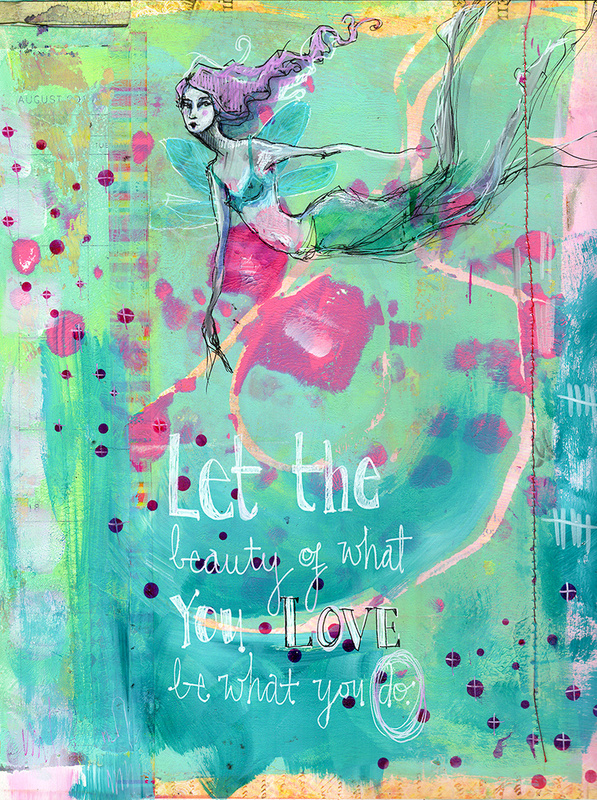 I will be using my Jane Davenport x Gelli Arts printing plates of course! Lesson 3 – Dripping with deliciousness! Seeing a blank page instantly turn from an open expanse of white to an ocean of puddling and swirling colour lifts the spirits. I will be sharing my techniques on keeping colours clear and building dense, complex color swatches. Another wonderful method of building artwork is to work in acrylic ‘batches’. Colour play and variety of brushstrokes are they keys!  Lesson 5 – Having your Layer Cake & eating it too! 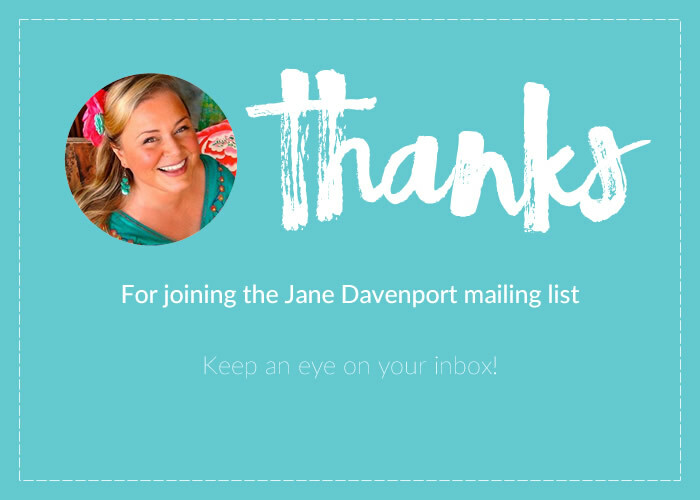 Building a library of backgrounds is a fabulous pastime, but they can bring so much extra joy! I will show you how I use my color experiments, including binding them into a 120 year old Victorian Era scrapbook cover! You need never feel embarrassed about not ‘clicking’ with a new skill straightaway. It’s a terrible feeling when you feel left behind, or that you dont ‘get it’ and everyone else does in a learning situation! But you won’t feel that way in my classroom because you can pause and rewind, and ask questions. The classes are video based. I talk you through each of the art supplies, what they do and show you how to use them through a variety of drawing projects and exercises. The videos are clear, fun , high quality and around 7 to 20 minutes each. Mixed Media means using all these supplies TOGETHER – so lets get experimental! 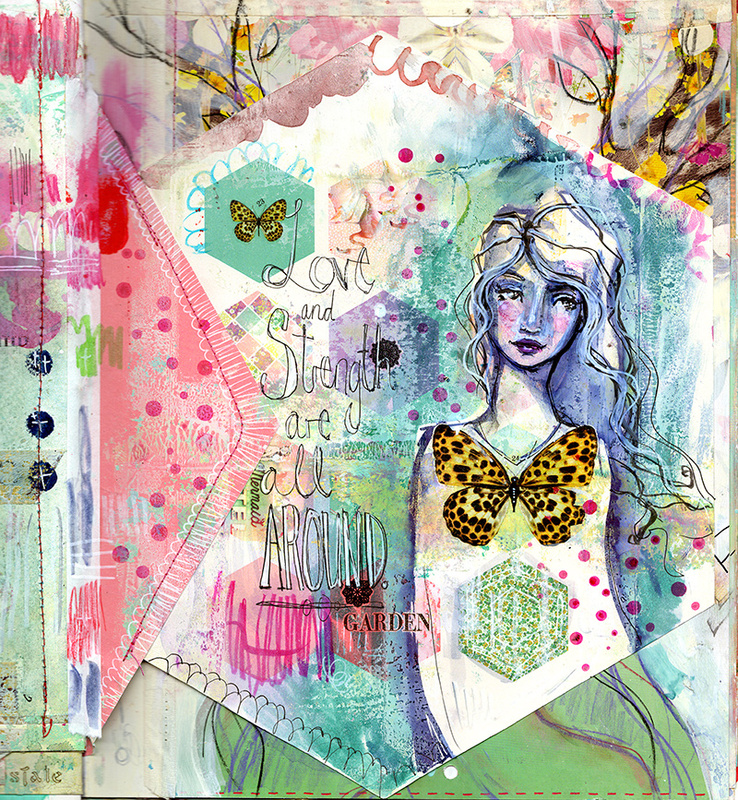 Mix-it-up with art mediums in a complete artwork or art journal page. Sometimes I will split an involved lesson over a few short videos. Intense creative nuggets! I believe it’s important for you to share your artwork as it increases your confidence, so I will ask you to upload your drawings and experiments into our private forum on Facebook. It may be nerve-wracking the first time you do it, but trust that you and your creative soul will benefit exponentially by being courageous and sharing your work! Full instructions are on the site if this is your first online class experience. Let me just emphasise that you don’t need all the art supplies in the universe to complete your assignments! You can use whatever art tools you have. You will learn new ways of using what you do have, and be able to pinpoint what you may like to add to your creative life in the future without expensive trial and error. A fast computer & high-speed internet service to process & watch the videos will be vital as well as enough technical know-how to navigate the site. If you are regularly able to watch Youtube videos of up to 15 minutes in length w/o interruption you should be just fine. Do please make sure though, since tuition is non-refundable once your password to the class network has been sent. 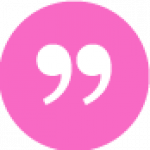 This classroom is such a hub of activity - its impossible to comment on all the posts but I have read most …and visit often to feast my eyes on all the talent you have unleashed in your workshop. I totally hoard art supplies but sometimes they lay barely used. You have really got me reaching into that art bag of mine and bringing out pens, pencils and paints like they were new. I just wanted to tell you how much I enjoyed your videos and all the wonderful feedback you and the other students gave me. Can’t thank you enough. Do you ‘suffer’ from Rainbowitis too? Let’s escape the crazy world and refocus energy on the beautiful things in life that are available to us right now. 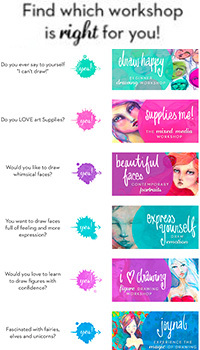 It’s time to reward yourself with creative confidence in your art supplies, loosen up and let your style out!